The Young and the Restless (Y&R) spoilers for Friday, October 6, tease that Abby (Melissa Ordway) will wonder if Zack (Ryan Ashton) is the right guy for her. She’ll express doubt to Ashley (Eileen Davidson) before opening up to Devon (Bryton James). Abby will suggest there’s a side of Zack that she just doesn’t like. Devon will contend that maybe things will work out. He’ll hint that Abby should give it some time before she makes a final decision. Meanwhile, Zack will rip into someone over the phone. The Young and the Restless spoilers say he’ll vow to to clean up their latest mess. At Crimson Lights, Sharon (Sharon Case) and Scott (Daniel Hall) will get updates from Paul (Doug Davidson). He’ll reveal that Alice’s (Tamara Clatterbuck) house was empty and she just landed in the hospital. Sharon will feel guilty about Alice being targeted, but Scott and Paul won’t think the hit and run was her fault. Since Alice is in critical condition, Sharon and Scott will feel like they need to go see her. They’ll be surprised when they walk in her hospital room and find no one. Zack will spy on them nearby. He won’t look happy about Scott and Sharon stirring up trouble. At Sharon’s place, Noah (Robert Adamson) will ask why Tessa (Cait Fairbanks) keeps leaving him in the dark. He’ll be hurt that Tessa didn’t tell him about the Alice drama sooner. Tessa will explain what happened and they’ll make up. That’s when Noah will stun Tessa with a suggestion. The Young and the Restless spoilers say Noah will want Tessa to move in with him. She’ll be caught off guard by the news, but she’ll agree to it. Once Mariah (Camryn Grimes) finds out, she’ll pretend to be excited for them. Of course, Y&R fans know Mariah will actually be pretty upset about the idea. Elsewhere, Graham (Max Shippee) will push Ashley’s buttons. He’ll note that her father would be proud of her latest accomplishment. Ashley will lash out at Graham for thinking he knows anything about John (Jerry Douglas). Graham will urge Ashley to calm down and realize they’re a lot alike. 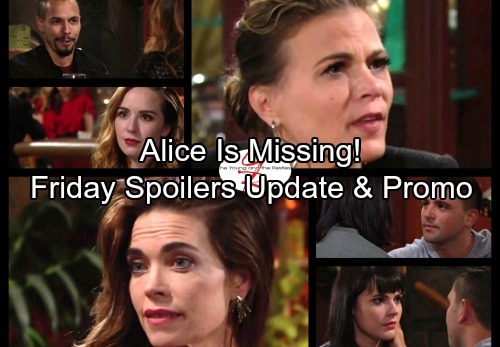 At the athletic club, Victoria (Amelia Heinle) will manage to infuriate Phyllis (Gina Tognoni). She’ll offer a clue about the kiss she shared with Billy (Jason Thompson) and argue that a reunion is brewing. At Jabot, a frustrated Phyllis will grumble to Jack (Peter Bergman). He’ll finally decide it’s time to fill Phyllis’ in on Billy’s betrayal. Phyllis will be taken aback when Jack spills the story. He’ll insist that Billy used Dina’s (Marla Adams) password on Phyllis’ laptop. Jack will think Phyllis needs to open her eyes and see Billy for who he really is. Phyllis won’t believe Jack at first, but it won’t be long until she changes her tune. We’ll keep you posted as other Y&R details emerge. Stick with the CBS soap and don’t forget to check CDL often for the latest Young and the Restless spoilers, updates and news.